Members of our Daughters of the American Revolution chapter attended the 106th Maryland State DAR Conference held in Hunt Valley, Maryland. The conference and other state-wide events are fantastic networking activities and a great way to see what other chapters are doing. The awards dinner was a particularly exciting event. Our chapter received first place in the State for the Chapter Achievement Awards with 906 points! The State average number of points for chapters was 256, so we really did so well. We also were one of the top three chapters to gain the greatest membership by percentage in the State. Our chapter is experiencing so much exciting growth right now including many members of my family and my dear friend Leesa. Check out our super cool white gloves. The presentation of Debutantes, Pages and Junior Membership Awards, were some highlights from the evening. The list of accolades the debutantes received was quite impressive! I also enjoyed a performance from Mary Ann Jung who portrayed Queen Elizabeth in period costume and demonstrated her favorite French dance, the galliard, with the help of some brave participants from the audience. Follow our DAR chapter facebook page and find out more about our activities. If you're interested in history or genealogy, this is the page for you! P.S. 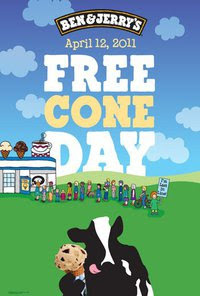 Today you can get a free cone at Ben and Jerry's from 12-8! What flavor will you choose? What a neat event! My Mother In Law is hugely active with DAR. Never got involved, but was honored with the DAR award when I graduated from HS. I LIVE for DAR. No, that's not an exaggeration. I am a Chapter officer of the John Alexander Chapter and of all the things I do socially, as well as the lineage societies I belong to, DAR is my favorite. I wasn't able to attend our state conference, but will definitely be at the Virginia luncheon and Continental Congress in July. Hope to see you there! Preppy Little Dress ~ Congratulations on your award! Kathie ~ I'll be there on Tuesday for the Maryland Luncheon and will also be there Friday night, Saturday to vote, and Saturday night! We'll have to make plans to catch up at Continental Congress. Looks like it was a wonderful time! Love the white gloves - I haven't worn them since my wedding. Your dress and cover-up are lovely, too! Congratulations on your chapter's success! The photos are lovely and it looks like you all had a wonderful time!